It’s been a busy week – one that began on Monday and feels as though it should have ended at least a couple of days ago. I took a TON of photographs for work and now have them sitting on my computer ready to edit. Sadly, I have not had the time (or frankly, the weather thanks to the never-ending Portland rain) to take many personal photos but I hope to rectify that over the weekend with a few sightseeing adventures around town. So, as a lead in to a (hopefully) relaxing weekend, today’s edition of five things Friday shares a few random, whimsical fun websites/articles/blog articles from around the web, including one that literally made me cry with laughter. 1. The top 15 most popular damn you auto complete texts of all time. Not appropriate for children but will make adults cry with laughter (well, this adult at least). Would love to create a photo story like this one day. It’s why I have such a passion for photography – sharing stories about real people with amazing images. I could do with one of these in my living room now that New Seasons no longer offers online shopping. Love the design elements, right down to the fake movie trailer. I hope to be back on Monday with stories and pictures from our upcoming weekend adventures. 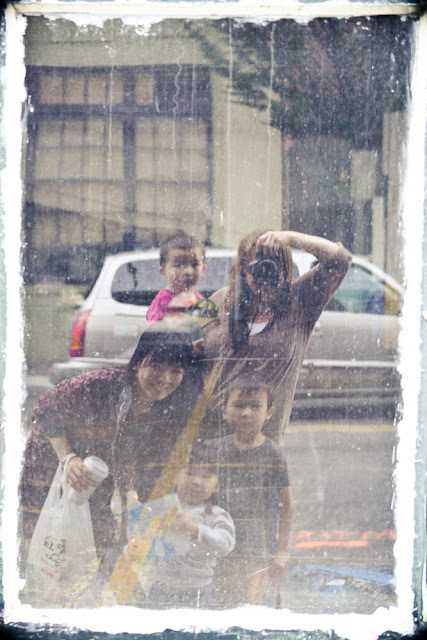 Until then, I leave you with a group portrait from last weekend taken in a wonderful old window in the Portland Pearl district. Kei wasn’t left out on purpose – he was at home painting our back room which is now ready for furniture (hooray!). Just a few short hours until I park myself on the new deck and settle in for a weekend of fun. Enjoy! This entry was posted in Family, Five Things Friday, Life, Photography. Bookmark the permalink.